A few years ago, Japanese artist Hiroshi Sugimoto began buying up all the Polaroid film he could find. He was using the stuff–which was “virtually obsolete” even in the early 2000s–to capture the colors of sunrise and sunset from his roof. “Consistently clear Tokyo winter mornings found me swimming in a sea of colors,” he remembers. The photos in Polarized Color are small–each is about 5 inches square–but after a visit to the artist’s Tokyo studio, Hermès Artistic Director Pierre-Alexis Dumas had big plans for them. Dumas invited Sugimoto to participate in the luxury giant’s Editeur series, which reproduces work from seminal artists on the company’s iconic silk Carré scarf. Dumas’s team selected 20 of the Polaroids, and using a newly developed inkjet printing technique, transformed the images into shimmering, luminous paintings, each measuring 22 feet square. The series, now for sale on Hermès’s website, debuted this summer at Basel’s Museum of Culture and will go on view at Hermès’s Tokyo flagship beginning November 14. 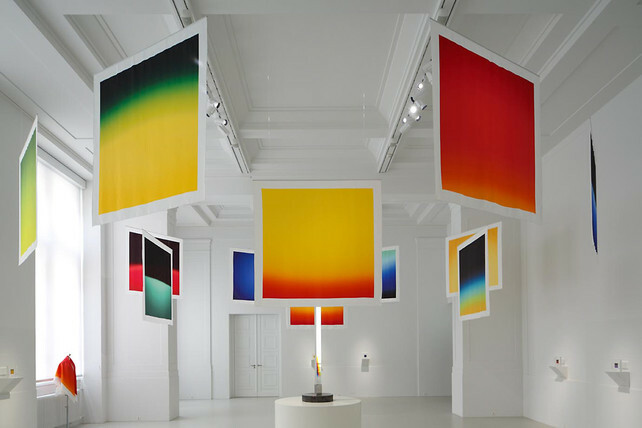 Sugimoto is the third artist to collaborate with Hermès through its Editeur series–Josef Albers was the (posthumous) first, Daniel Buren the second. At $1,000 a pop, the scarves are about twice as expensive as a regular Carré (and they’re sold in batches of seven). But look at it this way: Sugimoto’s prints typically auction for about $35,000 at Christie’s. So really, you’re getting a deal.